Maestro Peter Rubardt at work. Maestro Peter Rubardt conducting a performance at the Saenger Theatre. PSO Music Director Peter Rubardt relaxing at the Saenger Theatre. Maestro Peter Rubardt enjoying the moment. Children enjoying one of the PSO's Music for Families events. WUWF's Sandra Averhart talks with Pensacola Symphony Music Director Peter Rubardt about his 20th Anniversary season. The Pensacola Symphony Orchestra will kick off the 2016-17 season with their Opening Night performance on this Saturday, October 1 at the Saenger Theatre. This will be the orchestra’s 20th season under the direction of Music Director Peter Rubardt. 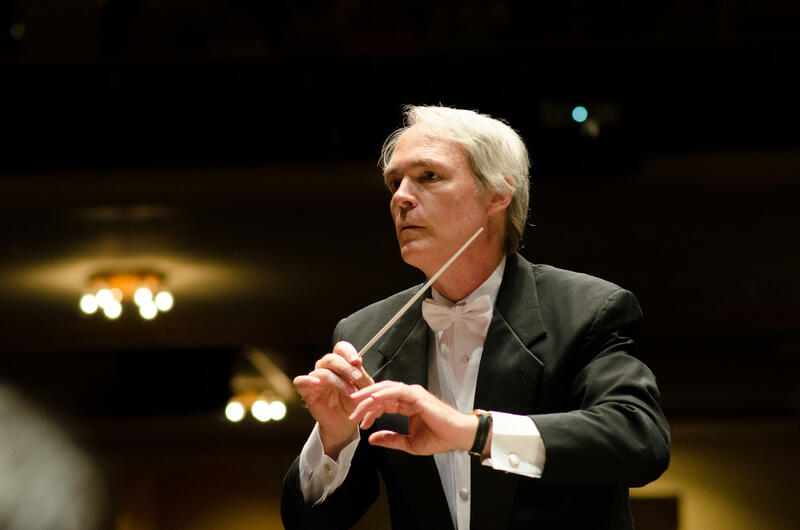 Prior to his appointment in Pensacola, Rubardt served four seasons as Associate Conductor of the Syracuse Symphony Orchestra and three seasons as Resident Conductor of the New Jersey Symphony Orchestra. When he got the job and arrived in Pensacola in 1996, he says he and his wife Hedi (Dr. Hedi Salanki-Rubardt), Distinguished Professor of Music at the University of West Florida and Yamaha Artist, had no idea that they would still be here 20 years later. Rubardt says when he reflects on his twenty years, he thinks about his own evolution as a music director and his understanding of the role that an orchestra plays in a community. 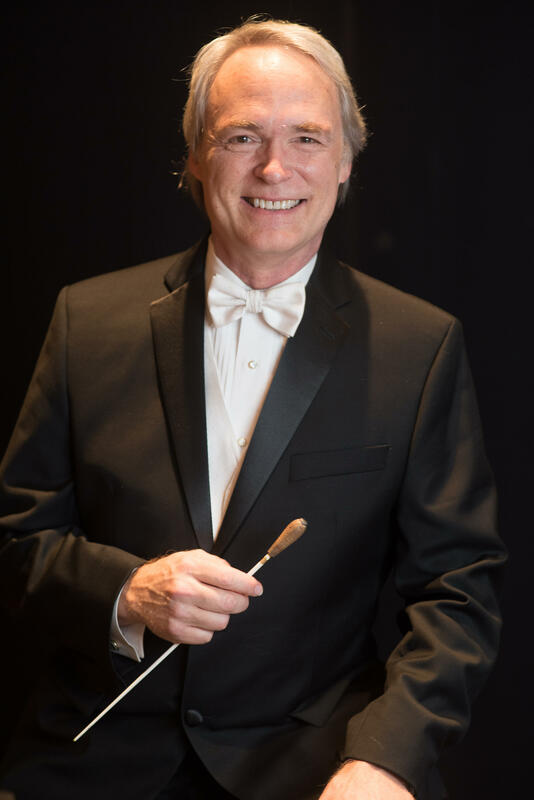 Maestro Peter Rubardt celebrates 20 years with the Pensacola Symphony Orchestra. Also, he’s proud of the increased professionalism of the entire organization. “So, in terms of the quality of the performances that we do, the way in which we interact with the community, the facilities we use, the quality of the players that come, the guest artists; everything about it has just steadily evolved to become a powerhouse regional orchestra, which is just a great place to be,” said Rubardt. What has changed and is a cause for concern is what Rubardt refers to as a ‘break in the pipeline,’ which feeds their “gray” audience. He points to a decline in music education around the country, and the prevalence of digital media. And, he says they can no longer count on parents to expose their children to classical music, since the parents themselves may not have been exposed. The PSO has always done music education in the community, bringing fifth-graders into the hall, hosting family concerts, and sending ensembles into the schools. As part of “Beyond the Stage,” they’ve established partnerships with various schools and send out PSO musicians on a more regular basis, as often as 8 times during a single semester, in order to build more meaningful relationships. 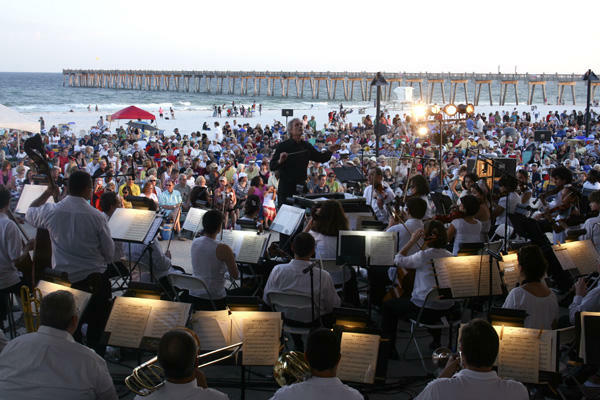 Pensacola Symphony performing at Pensacola Beach. The PSO also has taken the show on the road, with performances in local churches, at festivals, on Pensacola Beach and in places like Seaside. Also, smaller ensembles have gone out into the community to perform at places such as Nemours Children’s Hospital and retirement communities. One of the most significant happenings during Rubardt’s tenure with the PSO, was the most recent renovation of the Historic Pensacola Saenger Theatre. “That is really the seminal event of the last 20 years,” said Rubardt, recalling his first PSO board meeting at which he acknowledged the importance of the historic building, but also pointed out various issues with the old building that made it a difficult place to work. Rubardt credits builder Bill Greenhut with guiding renovation of the historic threatre to its grand reopening in 2009. Ironically, Rubardt says one the most memorable concerts during his 20 years in Pensacola, did not take place at the Saenger. It was the symphony’s first performance in the fall of 2004, just two weeks Hurricane Ivan. “The Saenger was closed, and it was obviously such a tumultuous time for the community,” said Rubardt, adding that they still did not want to cancel their upcoming opening night concert. So the scramble to come up with a Plan B began. After four days of brainstorming, he says they moved the program to Olive Baptist Church in Pensacola, changed the program to Beethoven’s 9th Symphony, and he says Kyle Marrero, then artistic director of the Pensacola Opera, somehow pulled together a chorus, and they found some soloists to perform. PSO Music Director Peter Rubardt conducting a performance at the Saenger Theatre. Opening Night is this Saturday, October 1, 7:30 p.m. at the Pensacola Saenger Theatre. The program begins with selections from Antonin Dvorak’s Slavonic Dances. Young artist, Bella Hristova, will conclude the first half with the enchanting Violin Concerto of Jean Sibelius. An exquisite pair of pieces by Maurice Ravel and Claude Debussy will close out the program. Looking ahead at the Pensacola Symphony Orchestra’s 2016-17 season, “Kobrin Plays Brahms” will be performed Nov. 5. The annual New Year’s Eve concert is Dec. 31. The PSO’s annual Beethoven & Blue Jeans concert is Jan. 14, 2017. The Pensacola Symphony closes its season this Saturday, April 30th at 7:30pm in the Saenger Theatre. Violinist Jennifer Frautschi will join the orchestra for a program of music by Bruch and Shostakovich. Music Director Peter Rubardt and Dr. Hedi Salanki stopped by the WUWF studios to share some thoughts on the performance. Hedi Salanki: It is hard to believe that it is time for the season finale. Peter Rubardt: That's right! It's been quite the season this year! One of the enduring strengths of Pensacola is that it has a remarkable cultural arts infrastructure for a city its size. From the many art galleries to the museum of art, the Little Theatre and the Opera, Pensacola showcases high quality shows and performances you might not expect to find, often showcased in the beautifully restored Saenger Theatre. But the city’s primary cultural arts asset has to be the Pensacola Symphony Orchestra, which recently opened its 90th season. That’s a remarkable run in a city featuring a downtown that has been left for dead more than once. The Pensacola Symphony Orchestra is holding its annual ‘Music for Families’ concert this Saturday, May 23 at the Saenger Theatre. The event begins at 9:30 a.m. and the concert starts at 11:00. The purpose of “Music for Families” is to provide a fun and entertaining introduction to classical music for children ages 3-12. The PSO launched the program about a decade ago, holding the first event at N.B. Cook Elementary School for the Arts. Say the word opera, and audiences often think of people singing stridently in a foreign language. This is not the case with “The Merry Widow.” A classic operetta by Franz Lehar, it’s set at the turn of the 20th century and filled with fun and frivolity. More than 60 people are taking to the stage to do a production soon at The Saenger Theatre.